There have long been rumors that John Owen Brennan is a Muslim convert. A member of this Confortium, John Molloy, Chairman of the National Vietnam & Gulf War Veterans Coalition, has heard of those rumors from his military sources. Now, we have published confirmation from a credible journalist. This entry was posted in Iraq, ISIS, Islam, Islamic State/ISIL, Muslim Brotherhood, Saudi Arabia, Syria, Turkey, United States and tagged 223rd Military Intelligence Battalion, Andrew Warren, CIA arms to Islamic State, CIA converts to Muslim, Greg Ford, Ground Zero radio, John Guandolo, Lieutenant General Michael Flynn, Michael A. 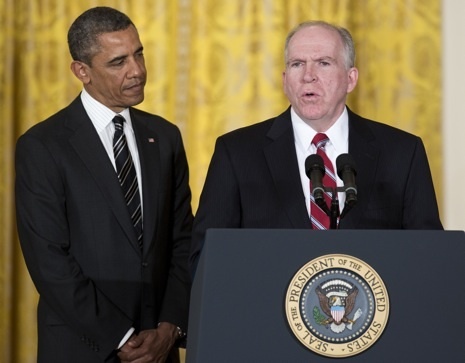 D'Andrea, Michael Hastings, Muhammad Abdel Karim Grimm, Obama's special bond with John Brennan, senators who voted against confirmation of Brennan as CIA director, Wahhabi Islam, Wayne Madsen, Wayne Madsen Report. Bookmark the permalink. For some time now, there have been persistent rumors that CIA director John Brennan is a convert to Islam. One source is John Molloy, Chairman of the National Vietnam & Gulf War Veterans Coalition. Now, we have a published source with compelling evidence. If the rumors and assertions are true, Brennan is a clear and present danger to the security of the United States. So why isn’t Congress investigating Brennan? Thanks for this article. Reblogged it on exposingmodernmugwumps.com Much appreciated, and just shows how infiltrated the Obama administration is with Muslims. More conspiracy theories. Taking the oath of office on the Constitution instead of the Bible is mostly done by atheists and agnostics. A true Moslem would take the oath on the Koran. And you can take the oath on a copy of Spiderman Comics if you want – the oath is to the country not to a religious faith. No religious element is required The rest of the article is speculation and rumor. Now i understand why indian hindu Modi was labelled a terrorist by usa. it is because of muslims. Allah is not Satan, Lucifer, or any imaginary devil. Allah is another name for God or Jehovah. There are demonic beings in the Muslim teachings, but Allah is not one of them. Your allah god calls for fighting and subjugating Christians, Jesus followers, and Jews, Sura 9-29. None of Jesus teachings of loving thy neighbor as thyself or any other teaching of Jesus is in the Quran, supposedly the allah god’s word. The allah god denies Jesus divinity and death on the cross, lies against the Gospels written 600 to 700 years before the Quran. Jesus gives us a clue when He says that Satan is the father of all lies. The allah god of Islam is Satan. this is fake news from Russia. These are the kind of articles that got us Trump. The U.S. is headed towards self destruction and people like the author of this rubbish above are working, knowingly or not, to achieve total dismantling of this beautiful country. Like Hitler, you will end up in the garbage of history books. Muslims are allowed to lie to infidels if it furthers Islam. It is called taqiyya. To take an oath on the Quran means nothing in terms of allegiance to America since the Quran, supposedly their allah god’s word, calls for fighting, killing, and subjugating unbelievers…99% of Americans…so what good is that oath to American loyalty? Supposedly, he also voted for Gus Hall (the perennial Presidential candidate of the Communist Party USA). That is something which would have certainly disqualified any applicant for rank-and-file employment at the CIA!